They ran a blood test, (after poking me three times), said I had 7 iron, ran an EKG and sent me home telling me to double my iron. Joey said a 7 iron reading should be admitted to the hospital. And he couldn't understand why the doctor hadn't. Maybe that explains why I felt “off” and had shortness of breath? He was going to army drill that weekend, and was concerned to leave me alone. We went to the ER that night. They re-did my tests—said my iron was fine. EKG was fine...and basically told me "don't be anxious." So I thought, I've joined all the "anxious-ridden" women in the nation and decided not to ask Joey any questions about my health. She immediately referred me to a GI doctor for an upper GI bleed. I pestered the GI doctor's office to "find my records" and "make an appointment." A month and a half later, I had an endoscopy. They found no bleed, but something big was pushing on my stomach from the outside. Big meaning 7-8 cm. Another month or so later, they scheduled a CT scan for the abdominal and pelvic region. At the follow-up appointment, the GI doctor said the baseball-sized cyst was pushing against my stomach and diaphragm which explains why I can't eat without hurting (it's like having that surgery that takes out half your stomach) and why I can't get a deep breath—because it hinders my diaphragm from lowering. 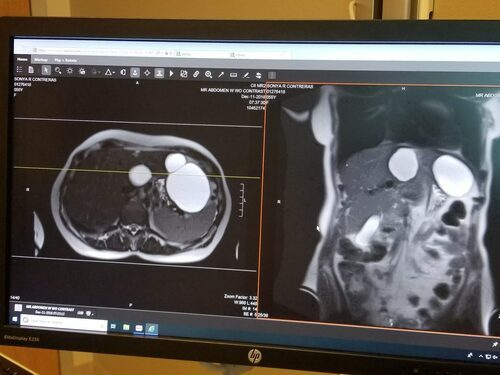 The GI doctor referred me to a liver doctor since the cyst was attached to my liver and scheduled a MRI. More blood work ruled out cancer and iron deficiency (which would indicate a bleed somewhere, which started us on this investigation). I waited for the GI staff to refer me to the liver doctor on their own sweet time. She took my information and called the GI doctor’s staff. The soonest appointment was a month later. When I told Joey, THOSE were the symptoms I was having back in March—that pressure, "off" feeling, something wasn't right... that started us on this road. He said, they did protocol—when you see a hoof, you think "Horse", thus the EKG but I had a zebra’s hoof, which they weren't looking for. Who would have thought cyst the size of a baseball that hinders your breathing? Only when I doubled the iron and showed more “tangible” symptoms were they able to diagnose the real problem. The liver doctor described the procedure as in-and-out in one day with “no pain” before, during or after. I was ready to be able to breath without gasping after standing and panting after moving laundry. I was ready for a night’s rest that wouldn’t be interrupted by feelings of “fullness” because I ate dinner after 4 PM and it sat in my stomach like a compression knot. I was ready to eat a lot and enjoy it again. I was ready for my heart not to be poked. and my bowels not not be smashed into not working. So the pre-surgery preparations included a colon clean (never fun), extensive drinking of pre-surgery protein drinks and sterilizing showers. The morning of surgery, my husband and I were talking about life. I told him, “I could die today.” (My timing was not the best.) He told me not to tell him that. I laughed and said, “This day could be anyone’s day to die. And I’m just anyone.” He wasn’t ready to hear that. Surgery went well. But the doctor lied to me. So much for no pain. He was testing a new patch that “should” control pain for 48 hours. It didn’t work. The post-nurse gave me all the medicine she was allowed. And sent me to dismissal still very much in pain. Glad I asked, otherwise, I’d wonder why I can’t lift my arm or shoulder, or breath without shoulder pain. Still I asked Joey if he thought they could have dropped me when they transferred me from the surgery bed to the hospital bed. It sure felt like they had. In recovery, I chewed ice chips and try not to move, although I’m suppose to breath deeply, which makes me feel all my incisions. Shifting my shoulder brings intense pain. The doctor did tell my husband he needed to take out all three cysts. All caused the symptoms. One of them very deep. He told him with a smile. He did send me home that day, said I did “Swimmingly.” Maybe my good behavior is when I’m under drugs and out. Breathing is painful. Don’t make me laugh. I pray I don’t have to cough, and throwing up feels like it twists my gut inside out and shoves me beyond tomorrow’s pain. I count down the minutes before I can take the next pain pill, and wonder how you don’t get addicted to these things when pain pounds in your body for longer periods than I will know. If I don’t curb my “no pain” before I see him, I may just kick him and say that shouldn’t hurt either. I am suppose to walk, take ten deep breathes every waking hour and not lift anything over 10 lbs for two weeks. Some day soon, pain aside, I will breath better and eat more (well, maybe that’s not a good thing), sleep better, and have the energy I had prior to this experience. I have lost that pregnant look—where I can’t see my toes because my gut is sticking out so far, so that should be encouraging. I’m grateful for them and my husband, who holds my hand when I cry because sitting is such an effort. Who would have thought? Remembering this past year, I can remember the frustrations of waiting, of not breathing, eating, and sleeping. But these things were minor compared to life happening around me. One son got married, another was engaged, two more have found women they are starting to know as their best friends, our married sons have their own struggles and joys. That doesn’t include what happened at our house, a whirlwind of activity. Life went on around me, regardless of my health. Was life awful? No, life isn’t awful. It’s just very full. Full of pain and joy. Knowing pain makes me appreciate comfort. Struggling to breathe gives not thinking about it a sort of ecstasy. Even eating is not taken for granted, at least for a little bit. Waiting brought a dependence on God. My pain was only physical, where surgery fixes and healing answers. It’s nothing compared to other pains. Hurts of the heart, where no knife but God’s can fix and where He alone must heal. Your trust in God is tested on a deeper level. You survive on His strength. You learn He is reliable and trustworthy. My pain will go away, not as soon as I want, but as soon I need. like breathing, eating, sitting, doing nothing but holding my husband’s hand, and trusting God. ‘Cause life isn’t so awful after all. What awfulness have you experienced recently that brought you to appreciate life better? Each day is much better. Probably shouldn't have published it so soon. I'm so, so sorry! You are very dear. Thank you for telling us your story, even in the midst of all the pain. I cried so hard I could not finish the letter. Your friendship means so much to me. Please don't ever use the word die and your name in the same sentence. You are so needed in this world. You bring us all balance and hope.